Sometimes a person will say something that's so inadvertently humorous, it's a desperate struggle not to laugh in the poor schmo's face. This is especially important to control when you're in the business of customer service. Many moons ago, I was employed by the cafe of our local Barnes & Noble. I quickly became an ace barista, whipping up a venti half-caf nonfat no-whip caramel mocha at 190 degrees and with two extra shots before you could even repeat that ridiculous order. We always had a mighty impressive bakery case, full of cookies, cheesecake, bars, muffins, scones, and sandwiches. Sadly, it all came pre-packaged and frozen, but hey--we did bake the cookies and scones! Speaking of scones, I've never liked the suckers. They're either too dry or not sweet enough (or worst of all, both!) for my tastes. Not even our cinnamon scones could do it for me. 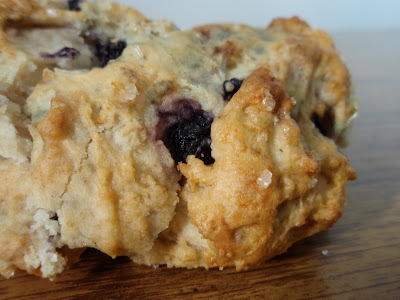 I recall one lady in particular who was quite fond of our blueberry scones. However, it was extremely difficult to hold back the laughter when she would boldly demand "one blueberry sconce" with her coffee. Had I been raised more poorly, I would've replied, "We're fresh out of sconces, but we do have some lovely candelabra in the back. Can I offer you one of those?" Anybody else see Falkor from The NeverEnding Story in this shot? I surely do. Yep, we could count on her to bungle it every single time. No one ever corrected her, bless her heart. I'll bet she's still saying it. This recipe didn't magically make me like scones (or sconces, if you must know), but it comes pretty close to being tolerable. They were plenty fluffy, just not quite sweet enough to meet my sugar needs. Do you have an awesome scone recipe that I should try before I pass the final verdict? Whisk the dry ingredients in a bowl. Cut in the butter until the mixture is unevenly crumbly. Gently mix the blueberries with the dry ingredients. In a separate bowl, combine the eggs, yogurt, and vanilla. Add this mixture to the dry ingredients and stir very gently, just until combined. The dough will be quite moist, like cookie dough. Scoop blobs about 1/4 cup in size onto the prepared sheet, leaving about 2" between each. Brush each ball of dough with a bit of milk for a nice, brown top. Bake the scones for 20 to 24 minutes, or until lightly browned and a cake tester inserted into a scone comes out dry. Remove from the oven, and serve warm. I required abundant blueberry jam to make mine palatable. Reminds me of my aunt who always gets the frisbee salad (instead of frisee). I prefer my scones savory, and developed a delightful recipe with bacon, cheddar and scallions. If you prefer a vegetarian version you could omit the bacon. I've never been a huge scone eater either, although I do like the Starbucks cinnamon ones...I have never attempted to make them either. My husband detests them. I have a sister-in-law we all call Miss Malaprop. She is a hoot. And has a great sense of humor to go with it, thank God. Must admit I love scones. Graduated from my Grandmother's biscuits to scones after a trip to Great Britain. So many things you can do with them. I'll add your recipe to my file and try them once we polish off the pumpkin ones I have left. I too hate it when scones taste like sconces! Surely, the Grace-ified scones are buttery, light, fluffy and perfect with tea or coffee. My dad used to say "I gouged myself" instead of "I gorged myself." Cracked us up every time. The B&N near the wharf in San Francisco used to serve cinnamon scones that I was addicted too especially warm out of the oven. heehee, candelabra!... My hand does not automatically reach for scones over other pastries, but I do like them heated with extra butter or whipped cream or other gooey sweet stuff. Grace, great story and awesome looking scones! I agree that they need to be moist and flavorful. Too funny! I hope I don't do something like that that no one corrects me on! I agree, they are usually not really sweet, but sometimes I like them that way. If I were you, I'd give up on scones and just go straight for the muffins! This brings back memories of all the customers who when through my line when I was a grocery clerk years ago. OMG. As for the sconces, I'll take mine in brushed nickle, please :) Actually, I do love them in any size or shape I can get them in -- except when they're dry, or what one expert baker from the UK call "stones" because they're so heavy. I'd say he was about right on most of the purchased scones I've had around here. The yogurt sounds wonderful in these! I have tasted some great scones but for some reason, Starbucks scones have been too dry. Perhaps because they are premade and baked. OMG that is too funny! I remember being behind an older couple at a fast food restaurant 15 years ago and the woman order Fa-ja-eye-ta's and the poor counter kid had no idea what she meant. She apparently didn't know that J's are pronounced H's in the Spanish. grace you have no idea how much I enjoyed reading this post. I have to share with you that it reminded me of the time I was at the gym and brought a batch of whatever scones I had baked at the time, and one of the muscleheaded men came over to me and asked me if I was the one that made those 'sconces'. I was jaw-locked because he was HUGE and I thought he was going to beat me up, and also because he called them 'sconces' and the gym had actual sconces as lights. I never did correct him, and told him yes I made the scones (he didn't catch on when I said it right), but he did ask me to make him a batch. I recently discovered an amazing, super easy and surprisingly light scone recipe. It's endlessly adaptable which is definitely a plus! You know, I've never had scones, though I do have quite a few sconces. That's pretty funny. Poor lady! I like scones, but I understand where you're ocming from--often they're too dry, too sweet, not sweet enough, etc. I like homemade ones best. Baking Illustrated has a great recipe for currant scones, but I also like Ina Garten's cheddar-dill scones if you're up for a more savory scone. This was such a cute post! I needed a good laugh. Beautiful scones by the way! I wasn't a huge scone fan before, but yum, I sure am now. The blueberries may also have something to do with it. I really haven't found the perfect scone recipe yet either but scones are good wih lemon curd or clotted cream ontop. Now im going to spell scones as sconce. I'm with you on this one; scones just aren't my thing. I've only tried sweet ones, though. Maybe savory is the way to go for us! Happy New Year! I have plenty of sconces on my walls, because my house is old, but I've never had a scone. Not sweet enough would probably fill some of my men with glee. Thanks for the chuckle. i love sweet scones. and savory ones too! homemade scones are ALWAYS better. heehee. Oh jes I have quite the sconce for jou! The maple walnut ones on my blog. They are so creamy and the glaze over top puts them in the sweet category. 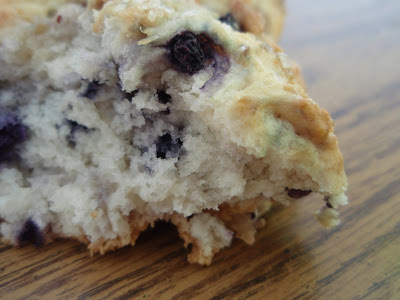 Your photo of the blueberry scones make them look really good, but I've never been crazy about them either. I'd probably be more inclined to try a savory scone with a nice bowl of homemade soup rather than a sweet one with coffee, but that's just me. Would it be bad to just put a big pat of butter on top and pop it in the microwave? For a scone to be good...at least for me...it has to be homemade. These look lovely. It took me a long time to find the right recipe for them...with creamy butter and jam...yum! Your scones do look so lovely & very inviting, Grace!! Have a wonderful, fun & healthy 2010!! Your mom would be proud that you didn't make the poor woman feel like an idiot. Although, I have to admit, she is funny. Your scones look delicious! I love scones, and I'm always trying to find a better and better recipe. Right now, my favorite is pumpkin scones and I'm about to make some as soon as I stop typing. To sweeten them up, you can always add a thick powdered sugar icing. Don't give up on them! Pretty tolerable, you crack me up, great post! I can always count on you for a cheerful start to my day Grace! That's too funny.I'm still not quite sure about sweet scon(c)es but I do like savoury ones. (Australian cook Belinda Jeffery has some good recipes for those). Your blueberry ones may just convert me though! Happy New Year. I have so many things to say about this post. 1. I've always wanted to work at a Starbucks...is it as fun as it seems, or is it stressful? 2. I LOVE the neverending story reference! That made me smile, I thought I was the only one who ever thought about that movie :) and 3. Definitely try the pumpkin spice scones on my blog. My husband claims to dislike scones for the same reasons you do, and he loves the pumpkin spice ones. It could be the icing on top :) Although, I also have chocolate chip cream scones on my blog that are good as well. but start with the pumpkin spice. I have no recipes to share about scones but, I love them ( not too sweet) with a great cup of Starbucks or a strong homemade coffee. Grace: Your scones look divine. wishing u a very happy new year !!! I love scones because they're usually not to sweet so I guess we're opposites, but if you want it sweeter, add a sugar glaze. they so look so moist! so often the ones we get in the good ol' US of A are dry and unappealing! 6 tbs of butter, 2 eggs and 1/4 cup of yogurt for 2 cups of flour will do the trick ")..
is that yogurt full fat? can kefir with some fresh vanilla bean work as well? Love the addition of blueberries - what a delicious way to start the day! I do like scones. A local bakery offers some killer Chocolate Hazelnut Scones. I guess the crunch and the quantity of chocolate makes up for the lack of sweetness. It's a good trade off. I tend to pass up the scones when presented in a bakery or coffee shop. I am the unlucky one that gets the driest, most boring one on the shelf. Gag. Yours look tasty though so I would definitely give yours a try if you feel the need to overnight them to me! Happiest New Year to you, Grace. And I too see Falkor of Never Ending Story! I love that movie! I hate dry scones too. Yours look so moist and fluffy! Happy new year! The thing is, they are supposed to be a fairly bland and unobtrusive platform for 2" of jam and clotted (not whipped) cream. It's all about the topping. Hey....these look delicious! grin.... Happy New Year...thanks for stopping by my humble cooking blog and your kind comments. YOu have the best best best cake recipes you have been sharing the past month! I only love one scone, and it's at our local French bakery. I think they use European flour, because I have been unsuccessful in my attempts to duplicate it. I will be trying again, once I get through my long queue of baking projects. I don't like fluffy scones. This one is denser. It's not sweet, but it doesn't need a thing to enhance it, no butter, no jam, it's perfect as is. A little honey drizzled inside or on top solves the lack of sweetness problem. Now I want a scone instead of the cereal I just ate. Yes I woke up late and yes I am sorry I have not been around much. My holidays were insane-o. My poor blog and my checking out other blogs has suffered. I looked through my flour to sugar ratio in the scones I have made on my blog--you might try the butterscotch ones (forgive the link), which have a hefty dose of brown sugar in them. You could sub dried fruit in for the chocolate chips to make them more breakfast friendly I suppose. :) But don't tell me about it! I want the chocolate! I've never really been a huge fan of scones, but had one over the holidays that I actually really liked (from Starbucks, none the less). It was blueberry and looked a lot like yours! yum! I grew up in England and they were known as scones but it was pronounced like Skons and I think that's what that lady was saying when she ordered them. This makes me laugh because at my job (which is a lighting store) I can't even count how many times people come in asking for scones instead of sconces. I keep wanting to tell them they'll have to head out to the nearest bakery or the like!